Oh man, people, the geek girl in me is downright giddy right now. This month’s box was freaking amazing. I’m a geek, but I’m also a girl. I dig girly things. Makeup, scarves, jewelry, stickers, it’s all awesome. I also like magical unicorns. Don’t like that? Deal with it. I just signed up for Gamer Girl Monthly a couple of months ago, but it’s so freaking awesome that I can’t even. Really. I can’t even. Someone, get me a pumpkin spice hot chocolate, stat! That’s the pile of goodies. Treasure Mini-Flair: Seriously, I’m looking for a way to display my mini-flair and pins. If anyone has an idea, I’m looking for it. Legit. I need something. Right now they all sit in a basket. 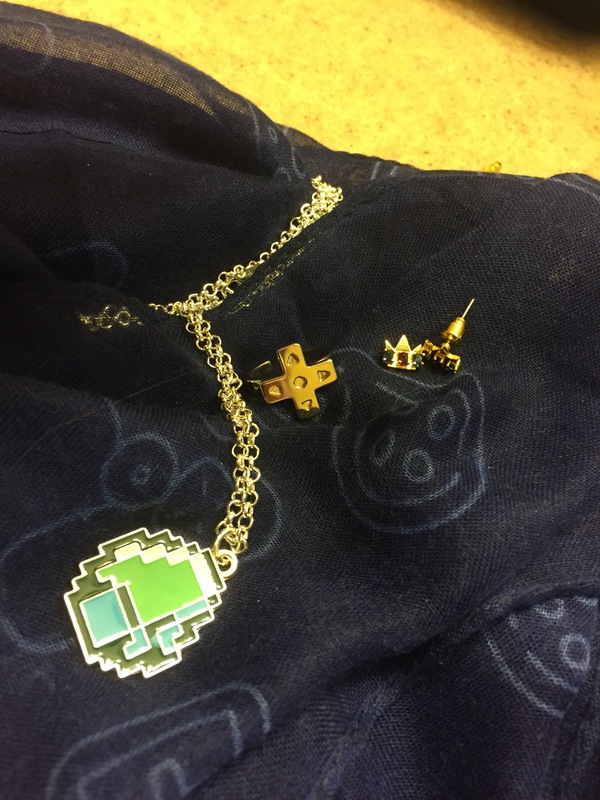 Minecraft Diamond necklace: Ok, so this is a little cheap and silly, but I love Minecraft. That 8-bit stuff is hard-core awesome. Also, I’m scared to death of the Creepers. Hopefully my diamond pendant will scare them off. Game controller pad ring: This is open in the back which allows for fitting to different sized fingers. But now I can show my gamer pride with a D-pad ring. I laughed out loud when I opened this. Then threatened my sons that I’d bite their fingers off if they tried to swipe it. Soft blue scarf with game controllers printed on it: I’ve worn this scarf three times already. I wish I could tell you that wasn’t true, but if you watched my video of my 2015 faves, well, it made the cut. The scarf looks so fashionable and then you get up close and go, “Wait a minute…” I absolutely love nerdy things that hide in plain sight. For real. I don’t know that this could have gotten any better. This bag of goodies was balanced between simple, fun, and elegant. Let me know what you think in the comments. Watch my Instagram where I’m going to try to find a look that will shine with that scarf. I’ll take requests and ideas!